There has been limited coverage of the corporate responsibility (CR) practices of small and medium-sized enterprises (SMEs) in the mainstream CR literature. Furthermore, there has been no systematic analysis of the responsibilities of the high value jewellery industry and jewellery SMEs in particular. This study explores the potential for harm and value creation by individual stakeholders in fine jewellery production. Using the harm chain and institutional theory to frame our investigation, we seek to understand how small businesses within the fine jewellery industry respond to the economic, social and environmental challenges associated with responsible jewellery production, and to investigate how they perceive and negotiate the tensions between responsibility and the resistance derived from the operational norms of secrecy and autonomy within the industry. Our exploratory research provides illustrative examples of how complex harm networks operate within and across the fine jewellery industry, and demonstrates the inter-relationships that exist across the different stages of the fine jewellery harm chain. Findings suggest that institutional forces are coalescing towards a more responsible agenda for the fine jewellery industry. Moreover, while CR is a tool to disrupt harmful institutional norms and practices within such an industry, it requires the co-creation of new transformative business models and multi-stakeholder involvement including firms (SMEs and MNEs), trade associations, non-governmental organisations and consumers. Solutions include national and international legislation, price adjusted certification routes for small firms, harmonisation of industry CR standards to reduce overlap in certification and regulation and gem and precious metal “track and trace” schemes. The jewellery industry enjoys a high profile worldwide, yet is often critiqued for the way their business is conducted down the supply chain, particularly now with the growing expectancy that firms should become socially responsible and address the influence of institutional forces (Brammer et al. 2012). Although corporate responsibility (CR) has moved into the mainstream (Baden et al. 2011), CR research has focused primarily on large organisations rather than small and medium-sized enterprises (SMEs1) (Carrigan et al. 2011; Jamali et al. 2009; Morsing and Perrini 2009), rendering the transferability of existing theory inappropriate to smaller firms (Sen and Cowley 2013; Baden et al. 2011; Preuss and Perschke 2010). The limited amount of research on the SME sector is also disproportionate to its economic impact, since it represents 99 % of all enterprises (European Commission 2013a; Pedersen 2009; Jamali et al. 2009; Spence 2007). Therefore, while the impact of individual SMEs on social responsibility is likely to be small, their collective impact is substantial (European Commission 2013b; Carrigan et al. 2011; Jenkins 2009; Roberts et al. 2006). This represents a knowledge gap with regard to “a tailored perspective” on CR for small businesses within “a bespoke research agenda” (Spence 2007, p. 533). Our research responds to this empirical gap and explores the challenges of embedding responsible business practices for SMEs that operate in complex and fragmented industries such as fine jewellery; thus, providing a rich understanding of CR in a previously under-researched sector. Limited understanding of responsible business practices in SMEs has been further amplified by a failure to recognise differences within SME categories and the contextual impacts found in local clusters or traditional sectors (European Commission 2011; Spence 2007). By using the fine jewellery industry as context, this study addresses those knowledge gaps, and the paucity of studies in the creative industry sector (Carrigan et al. 2013b; Chapain et al. 2010). The fine jewellery industry operates from unique geographical clusters and distinctive networks of interdependent SMEs with local and global connections built on trust, but it is criticised for its lack of transparency and traceability (Pollard 2004). Under pressure to adopt more responsible sourcing and production practices, the fine jewellery industry has the potential for both harm and value creation. Our study seeks to explore the potential for harm and value creation by individual stakeholders in fine jewellery production, to understand how small businesses within the jewellery industry respond to the economic, social and environmental challenges, and to investigate how small businesses perceive and negotiate the tensions between responsibility and the resistance derived from the operational norms of secrecy and autonomy within the industry. Social responsibility and SMEs are often presented in terms of opposition and tension (Morsing and Perrini 2009). Consequently, we explore fine jewellery practitioners’ understandings of the relationship between responsibility and small business practice, taking care to address both positive and negative aspects of this relationship. Our first research contribution is to extend knowledge of small business responsibility within the CR and Corporate Social Responsibility (CSR) literature. Secondly, the paper represents a theoretical extension of the CR and SME literature to incorporate the harm chain and institutional forces that impact on embedding socially responsible behaviour in small business culture. Finally, this study delivers comparative primary data that have the potential to contribute, both theoretically and practically, to ongoing debates about responsible business practices within complex and fragmented industry sectors such as the fine jewellery industry. The paper now briefly reviews the key literature on CR and SMEs, followed by an overview of the theoretical frameworks. Universally accepted definitions of CR and CSR regarding both large and small organisations remain elusive. For example, Spence (2007) adapts Davis’s (1973, p. 312) characterisation of social responsibility for her definition of CSR, which entails “the firm’s considerations of, and response to, issues beyond the narrow economic, technical and legal requirements of the firm to accomplish social (and environmental) benefits along with the traditional economic gains which the firm seeks”. Indeed, Spence (2007) CSR definition decidedly encompasses the economic, social and environmental aspects of CR, and mirrors the Global Reporting Initiative core performance indicators.2 However, Carroll et al. (2012) suggest that defining the responsibilities of businesses through the term corporate social responsibility becomes problematic due to the word ‘social’. The authors argue that, instead, we should address such responsibility considerations as CR rather than CSR, as CR holds a middle ground between capitalism’s critics and its advocates. We thus follow Carroll et al. (2012) and use CR within this work. While the CR debate has predominantly focused upon ‘doing good’, little attention has been focused on ‘avoiding bad’ (Carrigan et al. 2013b; Lin-Hi and Muller 2013). 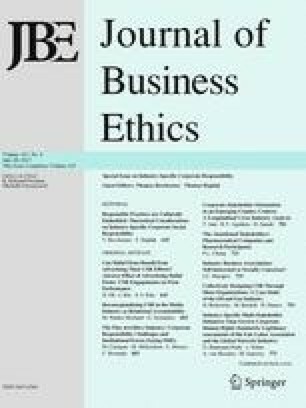 Although smaller firms are not necessarily subject to global critique when exposed as behaving irresponsibly, they are still vulnerable, particularly in their immediate communities, and business reputation remains a primary objective for their engagement with CR (Sen and Cowley 2013). Consequently, researchers must reflect on the distinctive aspects of a small business perspective within CR (Spence 2007). Such aspects include the need to use a recognisable vocabulary and approach rooted in the empirical reality of the small business context; the lack of codification of CR in small businesses; the importance of personal motivations to engage in CR by business owners; the moral proximity with community and customers experienced by small businesses; the flexibility, personal service and relationships characteristic of small businesses; the social imperative of maintaining livelihoods for their employees; the sector context influencing the culture of small business social responsibility and the distinctive competitive relationships whereby a moral responsibility may be felt towards fellow competitors who represent colleagues or stakeholders rather than ‘enemies’ (Spence 2007). These characteristics of social responsibility in small businesses suggest a distinctiveness that potentially renders theory drawn from ‘large firm’ perspectives less transferable. Greater recognition also needs to be given to the interdependent sector networks (i.e. trade associations; intermediary organisations) that support small businesses to overcome (perceived) barriers to responsible practices (Lawrence et al. 2006; Simpson et al. 2004). SMEs prefer advice that is company-specific and face-to-face (European Commission 2013c; Simpson et al. 2004), therefore the specialised information and mentoring that sector networks can provide may be a way to encourage and sustain socially and environmentally responsible behaviour among SMEs (European Commission 2011; Lawrence et al. 2006). How SMEs treat their stakeholders (i.e. avoiding harm), depends on the institutions within which they operate, but these institutional factors have been overlooked in past studies of small business and social responsibility (Soundarajan et al. 2013), something that we address below. Polonsky et al. (2003, p. 346) propose the notion of the harm chain, which allows “firms and public policymakers to consider fully all who are harmed, as well as those who can address harm throughout the harm chain”. Previous studies have used and extended this theoretical framework in various contexts such as the clothing industry (Carrigan et al. 2013a), social marketing, public policy and alcohol consumption (Hastings and Domegan 2013; Previte and Fry 2006), tourism (Clarke et al. 2014) and pharmaceuticals (Hoek and Maubach 2005). We have selected it for our study given its suitability for addressing the relationship between stakeholder responsibility and small business practice throughout the supply chain, with a focus on both the positive and negative dimensions of this relationship. The harm chain suggests that within the business exchange there are four stages where harm can occur, namely pre-production, production, consumption and post-consumption. Recently, the marketing literature has characterised a transition from value in exchange to value in use (see Vargo and Lusch 2004) suggesting that consumers are intrinsically involved in co-creating value (Carrigan et al. 2013a). Thus, Previte and Fry (2006) improvement of Polonsky et al.’s (2003) harm chain using Vargo and Lusch (2004) ideas allows our analysis to fully include the symbolic dimensions of the jewellery industry. Despite the strengths of Polonsky et al.’s (2003) and Previte and Fry (2006) harm chain frameworks, they neglect a broader explanation of why such harms occur, which is why Carrigan et al. (2013a) further enhanced the framework with an additional dimension, namely ‘institutional forces causing harm’. This dimension, captured via the lens of institutional theory, “provides a rich theoretical foundation for examining a wide range of critical issues and also allows for theorising at multiple levels of analysis” (Kostova et al. 2008, p. 994). Although institutional theory has been used to “explain both the persistence and the homogeneity of phenomena”, Dacin et al. (2002, p. 45) advocate that it can also explain individual and organisational action; that it can help to explain that “institutions serve both to powerfully drive change and to shape the nature of change across levels and contexts”, while also themselves changing “in character and potency over time”. Thus, institutional theory enables us to explain not only the institutional forces causing harms within the fine jewellery industry, but also how the same forces could potentially enable positive transformational change; it helps point to the drivers, processes, as well as the actions that can cause, but also tackle, harm. For example, the co-creation of harm around jewellery designers who ignore gem/mineral provenance during the pre-production stage, points to a regulatory need for stronger responsible sourcing policies and/or requirements to comply with environmental initiatives. An institutional perspective is useful to explain how structural elements such as professional traditions or political pressures construct the context of business practice (Soundarajan et al. 2013). DiMaggio and Powell (1983) identify three isomorphic forces by which institutional changes occur, namely coercive, mimetic and normative. According to Connelly et al. (2011), coercive isomorphism occurs as a result of pressure from regulators and actors upon whom the organisation depends for resources such as customers. Mimetic isomorphism relates to the imitation of other (competitor) firms or ‘benchmarking’ to reduce cognitive uncertainty. Normative isomorphism is associated with pressures arising from social factors such as trade associations, NGOs and the media. On recognising the omission of internal institutional forces (see Zsidisin et al. 2005), Grewal and Dharwadkar (2002) suggest an updated framework relating to the drivers of institutional change. Similar to DiMaggio and Powell (1983) coercive isomorphism is Grewal and Dharwadkar (2002) institutional process of ‘regulating’, as it refers to achieving stability, order and social welfare. The second institutional process proposed by the authors is ‘validating’ and involves establishing legitimacy via interactions with trade associations. Zsidisin et al. (2005) suggest that ‘validating’ encompasses both mimetic and normative isomorphism originally established by DiMaggio and Powell (1983). The third institutional process refers to ‘habitualising’ and consists of business activities becoming habitualised either via cultural norms and/or shared corporate beliefs. These factors characterise the institutional change process, including deinstitutionalisation and the emergence of new institutional forms (Dacin et al. 2002). The global environmental and social harm caused by fine jewellery SMEs primarily stems from the complex processes and networks that are a feature of a number of jewellery products (Carrigan et al. 2013b). Although there are many positives to arise from the business transactions that underpin fine jewellery SMEs, the harms which arise tend to be perceived as cancelled against, or subtracted from, the goods produced (Gowri 2004). As long as the industry tells itself that their actions bring about more good than harm, they are also less likely to reflect upon how they might work against those harms. While some voluntary certification processes that seek to eliminate unethical practices in the diamond and gold mining sectors (e.g. Kimberley Process, Fairtrade Gold) have been developed, much criticism has been directed towards such schemes for not going far enough (European Commission 2014a; Earthworks 2010, 2013), or for being inaccessible to SMEs in the industry, which hinders the responsibility habitualising process. Therefore, fine jewellery SMEs must consider how external stakeholder groups may perceive the responsibilities of firms to be broader than those self-defined by the firm (Polonsky and Jevons 2009). Thus, a research perspective that considers the harms associated with the marketing of fine jewellery is beneficial to our understanding of this field, since excellent social and environmental performance are now central to both competitive advantage and sustainability (Thøgersen and Crompton 2009). The next section discusses the adopted methodology. A qualitative approach was considered appropriate due to the exploratory nature of the study (Creswell 2007; Miles et al. 2014) and the lack of research investigation within the context of fine jewellery SMEs. Empirical data for this project were collected through in-depth, face-to-face interviews conducted with SME representatives and key trade informants at their premises in the Birmingham Jewellery Quarter (BJQ).3 Twelve interviews lasting between 1 and 2 h resulted in data saturation; this small number of participants is consistent with prescribed methodological approaches to explore fine-grained, in-depth inquiry (Sen and Cowley 2013; Crouch and McKenzie 2006). The interviews allowed participants to introduce and reflect on issues that they perceived as relevant to the research topic (Kvale 1996). As the location of one of the main UK Assay4 Offices and a significant fine jewellery market for SMEs trading locally and globally, the BJQ provided our geographical context, a decision that was also guided by scoping conversations with key industry contacts within the trade. This localised industry cluster is dominated by small firms employing less than 10 people (Pollard 2004; De Propris and Wei 2007). The jewellery sector is a particularly difficult industry to gain access to due to the secrecy and security involved, and the topic is a sensitive one for informants to discuss. For researchers, this presents particular difficulties as unsolicited approaches to businesses are likely to be rejected. Thus, using an intermediary within one of the major UK jewellery trade associations, the authors gained permission to access their members’ database, which features a cross-section of fine jewellery firms involved in manufacturing and retailing that source and trade their products worldwide. Thus, a mixed and emergent sampling strategy incorporating both purposive and snowball approaches was used to identify participants (Crouch and McKenzie 2006). It should be noted that unlike McFarlane et al. (2003), our context does not cover pre-production (i.e. extraction) stages of the jewellery manufacturing supply chain, but does engage with intermediaries throughout the supply chain, including participants that have links with extraction and sourcing. As a cluster, the BJQ is a contextual microcosm of the wider industry. Therefore, our sample permits an informed snapshot of the trade and its operations. All interviews were taped and transcribed verbatim to address issues of credibility and confirmability (Lincoln and Guba 1985). We have anonymised the participating organisations’ identities using pseudonyms and an identifier to indicate the nature of their business (see Table 1). Data analysis was on-going throughout the project, following a template analysis approach. Initially each author took two transcripts and coded them independently. Then we compared codes, agreed on which codes seemed to reflect the data best before analysing two more scripts and compared them again (see Table 2). “I don’t know, from a Fair Trade point of view, I don’t understand it enough. I’m not qualified. I get Fair Trade coffee beans. I get Fair Trade bananas. I get Fair Trade… All the other Fair Trade stuff. Nvivo10 software was used to support this iterative process, which led to the emergence of a coding template including thematic categories (King 2004). As the analysis progressed, more detailed codes emerged and findings are presented next. The main themes discussed in this section address the harm chain and institutional factors linked to business (ir)responsibility in the context of the researched fine jewellery SMEs. The presentation of the findings is structured according to the qualitative coding and emergent template-based thematic analysis carried out (Table 2). This, in turn, leads to the more focused discussion around the industry-specific adaptation of Carrigan et al.’s (2013a) extended harm chain framework (Fig. 1). In this way, the framework is used to both systematically develop a higher-order discussion around the negative externalities emerging from our qualitative research with SME jewellery businesses, but also to represent such issues and analysis visually. There are big things going on in the Quarter that we never hear about…as small, very small business people, we’re not considered to be players. It’s the people that have the proper businesses, you know, that sell the proper jewellery (Ruby). In the main, the jewellery industry is more fragmented than it’s been for a long time, and we have gone back to being that cottage industry with lots of little skills and pockets of people doing their own thing (Emerald). The small businesses can’t afford to be [CR] audited… They can fill out some forms but they can’t afford an annual audit that might cost them a couple of grand (Emerald). Although organisations to some extent choose and shape their own environment (Djelic and Ainamo 1999), there is a risk that the voices of SMEs at all stages of the fine jewellery harm chain (pre-production, production, consumption and post-consumption) are going mostly unheard among those forces behind institutional changes in the jewellery sector. The jewellery industry’s quite narrow…it’s close-knit but it’s also quite… It looks inwardly too much. I think there’s an element of protectiveness. I can remember when I first joined walking around the trade, people wouldn’t let me in, because they didn’t know who I was, and it took a good couple of years to be accepted (Pearl). It’s all hush hush…everyone’s like that, you don’t want everyone knowing your business…it’s a competitive thing and a security thing (Platinum). I’m quite open with knowledge… I feel that for our sector to continue to be here…imparting knowledge and enthusiasm for what we do is quite key. Now people perhaps are more closeted and closed when they feel that somebody else might take what they have, you know, take business away from them, which you can understand (Opal). It’s knowing people, knowing who’s around and having access to all those other trades and the suppliers. If you want something it’s just there…being able to collect everything, not having to do it all through the post and having personal relationships with the people that you’re working with (Diamond). I have to say it is a most wonderful community… I might have a diamond that would have cost £3000/£4000, and I’m making a ring for it, and I will take it to my setter, and he will set it for me, and there’s no paperwork goes between us… I don’t have to leave anything with him and he doesn’t have to leave anything with me, I know that when he phones me I’ll go back and collect it, and it’s done completely on trust around here… I think we craftsmen you know we’re just different (Silver). …We have to have trust, I mean, the last diamond I bought, for something, I did ask at the diamond dealer, is this conflict free, is it? And he said, to the best of his knowledge, it was, you know, and that’s all… I’m not going to look for a certificate or anything, I’m just hoping that he’s trustworthy (Ruby). Too much reliance on trust, particularly when it comes to mineral and gem provenance, can destabilise jewellery CR and perhaps open the door to potentially unscrupulous behaviour by rogue traders across the different stages of the chain, who might behave opportunistically. Probably the biggest challenge at the moment is that we’re still suffering on the back of the recession you know it’s hard to be selling luxury products. Stuff isn’t selling as much as it was so I think you’re still finding a lot of businesses are starting to go under as a result of that… You feel like you’re trying everything you can to keep your costs down, concentrating on surviving (Diamond). …We have voluntary codes. We don’t have legislation. So when I say voluntary codes I’m talking about guidelines produced by the OECD, the London Bullion Market Association, LBMA (Agate). I wear gloves when I’m doing it, the oxidising. I try to remember to do it, but I have to admit… I’m a bit you know a bit sloppy, so I do forget sometimes (Garnet). My diamond dealer… I trust him that he doesn’t sell conflict diamonds… All he does, on the bottom of the invoice each month, is put ‘we do not sell conflict diamonds’… So how do I know where them diamonds have come from? You can’t! And gold, how do you know they’re telling the truth? You see, the service has the facility to mark something but how can they prove it, I don’t know (Platinum). We have tended to live in a bit of a bubble and we’re not necessarily that aware of those kinds of issues. I mean, we see it played out in all sorts of other businesses and on the news and all of that, but it’s never really occurred to me that it’s something that I should be addressing, generally speaking… It’s not around us. Nobody’s that bothered (Ruby). It [ethics] would be something I’d follow, probably rather not lead in… As it mainstreams then it will get more affordable. I think more people will do it. It’s just not very easy yet and I think it needs to be easy before people really jump on board with it (Diamond). There is, in the industry, a fundamental awareness of ethical trading. It’s discussed a lot, it’s been debated at trade shows, we’re all involved in it, supply chain management and audits and everybody’s talking about it… It is a top down push… It’s not coming from the consumer. Without a doubt, if the pull is from the consumer, it would be much faster throughout the industry. If the push is from the industry, then people will always sit down and say, well look, it’s all very nice, but nobody actually needs to be pushing this (Emerald). I think most people are supportive of it [Kimberley Process]… Tiffany and people like that have literally got their own mine now, which, yes, that’s literally the only way you can guarantee full traceability… Tiffany can because, at the end of the day, they’ve got the money to do that, which hopefully will kind of come more into the industry, because if they’re doing it, well the next guy will think if we do that then we’re going to increase our [business]… So it’s starting at the bottom and it’s starting at the top, and hopefully, somewhere, it’ll meet in the middle, and we’re kind of in the middle really (Opal). …All we can do is ask the questions about suppliers and ensure they’re asking that of their suppliers and try to make the whole supply chain as transparent and as traceable as possible (Opal). In the absence of a stronger regulatory environment concerning responsible sourcing and production, many of the SMEs interviewed went on to discuss their interactions with trade associations responsible for the monitoring and benchmarking of jewellery production (i.e. validating influences). We weren’t in the British Jewellers’ Association at that time, but they would sort of start us on the right road. It’s the place to go to start you on the right road. I had a problem with a sapphire which I bought as real and then the customer said it was synthetic… So then I went to the Assay Office and they said it was real, so I sorted this out, but the British Jewellers’ Association would help you through that (Platinum). For us to buy something, some gold that was mined in Africa, directly, wouldn’t know where to start looking, you know, you get the odd African walks in the door, or a phone call…I’m talking about… from source….The thing about that is why would I want to get myself potentially jailed just because I want to buy 3000 pieces of gold from the bloke I don’t know. It’s never going to happen….you don’t go outside of those circles… (Gold). I think the whole ethical trading thing is wider than Fair Trade… We’re almost obligated to have a look at it properly and we’ve joined the RJC, the Responsible Jewellery Council (Pearl). I think there’s obviously certain suppliers in the quarter cottoning on to the fact that people want to know this information and, to a certain degree, I feel like maybe they’re exploiting it, you know, because they’re selling a higher value product (Diamond). We can advise, we can disseminate information, and we can get them involved [in CR]… There is evidence that demonstrates the companies that operate CR policies are those which are more commercially successful, because they’re engaging with their consumers, engaging with local environment, they are looking after their staff properly, they are looking at how they source their materials and this all adds up to a feeling of well-being… We aren’t that advanced… CIBJO some time ago had what they called an Ethics Committee and that’s now been reformed and the CR project has been taken under CIBJO’s wing… It’s very sort of bottom up, you know, we need to do this and we’ve now got a structure in which to do it (Agate). From our experience, people are interested but it’s not a deal breaker… Practically, it’s very hard for us to get it and it’s actually a lot more expensive, so if you ask me how many of my clients are adamant on Fair Trade…I’ve never had anyone…I still have, you know, pessimism about the whole kind of Fair Trade thing. I think for us and our clients the important thing is to be transparent and honest (Opal). I think the only thing you can ask people to do, at the moment, is to say to them, you have taken every reasonable precaution. …Because they can’t influence OECD regulations… But they have taken every reasonable step to ask the right questions and to get whatever assurances are available, be it a certificate, something in writing, whatever it might be (Agate). We have to be quite pro-active rather than reactive. This is what we’re now working on [trade mark]. It’s going to be a three year project. I’m going to the EU the end of this month to see whether we get some more funding for it… Effectively we’re talking about the CR project and we’re looking, very crudely, at maybe some form of kite mark, just some validation, so it can be on the retailer…We have checked our supply chain and our mission with this is to actually increase consumer confidence in the purchase of jewellery (Agate). Some SMEs showed interest in engaging more with socially responsible production practices, but for most, the additional costs involved in gaining accreditation from any trade association was simply a cost they could not afford to pay. There are however, many socially responsible, cultural norms that have become habitualised for SMEs in the BJQ. Gold has been around for centuries and centuries and centuries, and it is always being recycled, re-fashioned. So, in actual fact, you can’t say with 100 % certainty what the provenance is… And there is a great deal of hoo-ha about it, but it is gathering support. Cookson’s do eco-gold and they bill that as made from recycled gold. It’s all recycled! (Amber). Because gold’s gone up and stones have gone up I think that’s sort of encouraged them [consumers] to have it remade because they know it is worth something, therefore it is worth remaking as something you’re going to wear…So that’s mostly what we do (Platinum). I don’t think most people probably even think about it [provenance]… It’s not on peoples’ radar so much is it? I don’t suppose people think about where the metal comes from, how it’s done… They’re just thinking about the product they’re buying (Diamond). You come up against people who just want Fair Trade diamonds after the scandal many years ago… I’ve had it a couple of times [people asking for ethical stones]; it needs to be an ethically-sourced stone… But no one’s ever then said what are the mining conditions? (Quartz). It [Blood Diamonds] came out and in the six months after the film came out, if I got four calls from retailers around the country saying I’ve got a customer in my shop looking at one of your diamond rings, they want to be assured that the diamonds that you’re supplying are conflict free. So, hang on, for half a dozen people in a year maybe, I don’t know, we’re talking about nobody, and then all I had to do to that retailer is say, yes, don’t worry, we only buy conflict free diamonds from legitimate sources and if you have a look on the invoice for the ring that you’ve got, it says at the bottom, all diamonds are purchased from conflict free sources and are not subject to you know… And in every one of those half a dozen conversations, they went, okay, that’s fine, thanks. Most of the consumers don’t care (Emerald). If I put these products in my window, these are conflict free, these are… Absolutely ethically sourced. Fair Trade. Great product. Blah, blah, blah. What I’m saying, and I’ve heard this over and over again with the blood diamond issue, what I’m saying is, those 10 products in the window are… You can have all the ticks on the boxes you like, the 99 % of the other things in my shop I can’t tell you that, so hang on, am I a bad retailer? (Emerald). I really am minded that consumers are becoming far more savvy today with the knowledge they want to acquire before they go and buy an item of high value… I believe at some stage consumers will start asking questions and putting the retailers, and ergo the manufacturers, on the spot… Lovely ring, can you tell me where the diamond comes from? (Agate). So, despite the many economic, social and environmental challenges associated with responsible jewellery manufacturing discussed above, and some of the cynicism expressed, SMEs were of the view that momentum was gathering within the industry that signalled greater interest in CR for the future. To what extent that will trickle downstream and upstream, and impact upon the everyday operations of SMEs, is something more difficult to gauge. There is evidence that institutional forces are coalescing towards a more responsible agenda for the jewellery industry (European Commission 2014a; Earthworks 2010, 2013). Although CR is a tool to disrupt harmful institutional norms and practices within the industry, it requires the co-creation of new business models and multi-stakeholder involvement including firms (SMEs and MNEs), trade associations, non-governmental organisations and consumers. Alongside these collective validating efforts (Carrigan et al. 2013a), complementary legislative initiatives at national and international levels will need to provide regulatory pressure to incentivise that change. An early move has been the United States 2010 Dodd Frank Act regarding conflict minerals and more recently the European Commission Conflict Minerals (2014) draft legislation. Both seek to regulate the pre-production and production stages of the sector, but such institutional forces are driving a CR agenda primarily informed by ‘big business’ priorities while not necessarily alleviating the problems they seek to address, particularly those faced by small businesses across the supply chain. The Dodd Frank Act pertains to the regulation of tin, tungsten, tantalum and gold (i.e. conflict minerals) and impacts upon the Great Lakes region of Africa, specifically the Democratic Republic of Congo (DRC). Gold from designated conflict sources is prohibited and companies are required to demonstrate due diligence, and where required produce third party verification of compliance. Jewellery firms that use gold in their products do not want their brands to be associated with the abuses of war, and most end-users did not know their sources of minerals before Dodd Frank, so the law has forced them to look deeper. Since being imposed, there have been mixed reports regarding how effectively it has reduced harms and exploitation in the DRC. Some have argued that Dodd Frank has led to many lucrative mines in eastern Congo no longer being controlled by violent armed groups and started a shift towards legal and peaceful forms of natural resource extraction. However, artisan mined gold continues to fund armed commanders, with 98 % of artisanal gold smuggled out of the Congo, suggesting further reforms are needed to address conflict gold and close loopholes (Bafilemba et al. 2014). The jewellery industry has voiced concerns that burdensome reporting requirements will result in de facto boycotts on minerals sourced from the region and create more, not less instability. Unintended consequences of Dodd Frank are being reported by the industry that cite the closure of legitimate mines in the DRC and neighbouring states, and raises fears of more opportunities for exploitation (Layton 2015). However, Intel and Apple have recently announced that all gold in their computers and phones is now conflict-free, which suggests in some sectors, businesses are responding to the new legislation. The Kimberley Process, established in 2003 by a UN resolution, has also failed to deliver a comprehensive solution to the problems of conflict diamonds. Its narrow terms of certification focus solely on diamond mining and distribution, and do not address wider issues such as worker exploitation, health and safety or child labour. Corruption and smuggling remain prevalent in certain parts of the diamond pipeline, while most retail staff would struggle to confirm which country, let alone which mine their gems were sourced from. Proposed EU legislation for controlling imported minerals from conflict zones does not cover diamonds, and Fairtrade’s standard for gold, which helps artisan miners obtain a fair price, safer work practices and community investment does not relate to diamonds either. Conscious of both the stakeholder benefits and shortcomings emerging from Dodd Frank and the Kimberley Process, the jewellery industry continues to lobby the European Commission over the European Parliament proposed conflict minerals draft legislation that will also cover tin, tungsten, tantalum and gold. Having consulted widely on the potential impact of such regulation, the EU will vote on the draft in May 2015. While NGOs and other civil society groups seek a legally binding obligation for all upstream and downstream companies to undertake supply chain due diligence to identify and mitigate the risk of conflict financing and human rights abuse, a recent European Parliament briefing suggests that EU regulation could be delivered by voluntary self-certification (Layton 2015). Although some within the jewellery industry would prefer this outcome, critics argue that this will do little to engender change or support greater CR in the supply of ‘conflict’ minerals. The legislation, although underpinned by existing OECD guidelines, unrestricted in its geographical coverage (unlike Dodd Frank), and proposing incentives to comply for public procurement, essentially delivers an ‘opt-in’ scheme rather than binding rules, and is unlikely to offer a panacea for greater CR (Murry 2014). Despite their limitations, these regulations are coercive forces that will impact across the global jewellery industry, but nonetheless run the risk of failing SMEs for whom these grand narratives seem far removed from the responsibilities of their everyday business. However, there are some models of CR emerging within the industry that may provide greater traction. Canadian brands are using a ‘track and trace’ approach that provides comprehensive traceability for their gems to a specific mine. Each cut and polished diamond is laser-marked with a unique tracking number that consumers can independently verify, and track across the supply chain (Rhode 2014). One UK-based SME, Hockley Mint, is launching a range of ethical jewellery combining Fairtrade gold and fully traceable Canadian diamonds, targeting what it believes to be a growing market for conscientious consumption (Jordan 2015). This will be supported by a website where customers can validate and register their diamonds. Making initiatives accessible to SMEs is an important catalyst for their engagement with CR; our respondents noted how working with Fairtrade gold has proven problematic in the past for many small jewellers who either could not access affordable supplies (or in appropriate quantities) or meet Fairtrade accreditation requirements. To overcome these barriers, the Goldsmiths Registration Scheme was launched in April 2014 offering small designers a chance to work in Fairtrade gold or silver without having to have a full license or buy large quantities of metal. By offering small jewellery designers the opportunity to register with Fairtrade for free, and buy certified precious metals from a master licensee in a semi-finished form, the scheme has the potential to transform the UK market for Fairtrade gold and silver, and widen the use and customer reach of Fairtrade metals. Each designer can stamp items with the Fairtrade mark and the metal is fully traceable back to the mine. This offers affordable and pragmatic supply chain transparency and traceability that was previously limited to mainly multinational operators with substantial resources and vertical integration. Our findings demonstrate that if SMEs cannot make the connections between their business and upstream activity, then they will feel detached from the impact of their actions (see also Bradshaw 2012), resulting in habitualised ‘business as usual’. Moreover, they find it difficult to see how they can “manage social and environmental issues that exist outside their direct control” in distant economic, cultural and geographic settings (Pedersen 2009, p. 113). In such a fragmented industry, complex supply chains are inherently vulnerable and only as strong as the weakest link. To help SMEs engage with CR, a more inclusive process is needed that gives SMEs a voice in the debate. This will support the design of new tools and frameworks that can reduce the cost burden of managing responsible business standards (Baden et al. 2011; Pedersen 2009). Bringing CR into the discursive consciousness of SMEs is vital and may require reframing how activity is presented around CR to address the coercive forces that render perceived cost a barrier for small jewellery businesses. Thus, framing CR initiatives as cost effective (e.g. recycling), time saving (e.g. innovative technology), but also resource efficient and responsible could act as potent persuasive signals in the fine jewellery industry given that its practices at the pre-production, production and post-production stage lend themselves to these platforms. In addition, offering certification routes that are price adjusted to accommodate the resources of small firms (such as those offered by the RJC or Goldsmiths Registration Scheme) will go some way to assuage perceived cost barriers. Despite evidence that MNEs are increasingly conforming to normative pressures in order to remain legitimate in the eyes of relevant stakeholders (Carrigan et al. 2013a; DiMaggio and Powell 1983), the jewellery SMEs in our study felt they had insufficient incentive to adopt responsible practice. Moreover, there was a sense that the added value created by endorsing responsible trade initiatives was being unscrupulously leveraged by large firms to charge higher prices to a naive consumer. This raises doubts about the transferability of CR practices and signals across industries, and hints at the need for more bespoke CR solutions for the fine jewellery buyer. For example, it was evident that Fair Trade has so far had less traction in this industry, compared to the fruit or coffee trade, although initiatives such as the Goldsmiths Registration Scheme and increased supplies of Fairtrade gold may help in the future. Currently this form of institutionalised representation of ethical trading is perceived by some SMEs as a relatively meaningless marker of responsible jewellery business. Transparency and honesty, and proven trading relationships, can provide more reassurance to industry customers in jewellery transactions. This represents a different, more intangible validation that is hard to capture in any formalised way. Thus, it will require greater policy and government leadership to accelerate the progress of responsible behaviour. It was difficult for most SMEs to think beyond the everyday economics of business, and a range of institutional forces facilitate and hinder their ability to implement positive changes. Transformative change will require a move from a transactional model of regulation, to a transformational model that transcends self-interest (Palazzo and Richter 2005), where collaboration enables more rapid change. New business models that are less short-term profit oriented are needed, and fine jewellers must focus on responsibility considerations. Part of this will require the jewellery business to cultivate a broader conception of ‘value’, and help SMEs and consumers to appreciate the social and environmental costs of their practices. Indeed, one significant value-led activity for the SMEs in the BJQ and others world-wide, is their ability to redesign old jewellery and reduce waste, or recycle it productively, representing a particularly sustainable feature of the jewellery industry and one that is rarely promoted. Companies tend to view it as a commercial rather than a sustainability-informed transaction, but it has transformational potential across the harm chain given the finite aspects of many jewellery raw materials, the limited quantities of Fairtrade certified precious minerals being mined (Hilson 2008), and the many hazardous and irresponsible aspects of extraction. Consequently, one SME in the BJQ, discussed the potential to create an alternative (as well as affordable) responsible trademark for the consumer. This may be a potential solution, but the possibilities of creating a trademark that could provide reassurance across the complex supply chains represented by the many different gems and minerals involved in jewellery production, and receive support from the numerous global trade bodies and vested interests that control and monitor those pipelines remains a long term aspiration. It would also require significant cooperation and coordination between the stakeholders represented within jewellery supply chains, which although not impossible is not immediately apparent. There are moves within the industry to harmonise certain CR standards, and reduce unnecessary overlap in certification and regulation requirements, which would reduce resource demands on SMEs. One such initiative is the RJC’s recognition of the Fairmined standards which enhances market access for artisanal and small mine producers (RJC 2013). Considering the pivotal yet conflicting role that small scale artisan mining plays in pre-production harms, poor due diligence and compliance, while also acting as a significant global producer of minerals and gems, source of employment and community development, bringing artisan miners into the responsible supply chain is a crucial step forward in jewellery CR. Supporting downstream buyers (including SMEs) to confidently source artisanal-mined minerals and gems that are untainted by conflict or exploitive practices through Fairmined or RJC initiatives might encourage jewellers to proactively engage with their consumers around this point of differentiation in their offering. According to Pedersen (2009) CR in the supply chain can be driven by both deeply held values and narrow self-interest, something that was apparent in our findings. This means a multiplicity of collaborative efforts are necessary to choice edit product offerings (Mayo and Fielder 2006), achieve greater homogeneity in social and environmental disclosure in supply chain exchanges (Jenkins and Yakovleva 2006) and support SME mentoring on CR. More and better industry collaboration and knowledge sharing around the benefits of CR are necessary to raise standards across the supply chain (European Commission 2013b, c). Mentoring and exchanging good practice experience has been signalled as an important route to engaging SMEs, particularly if that knowledge exchange comes from industry insiders. Large firms could offer help and guidance to their smaller suppliers to overcome some of the cost and resource burdens of certification, while trade associations might follow the example of France’s UFBJOP7 offering support mechanisms with CR certification processes. UFBJOP joined the RJC and has taken an active role in promoting the adoption of certification among French jewellers to both “live up to an internationally recognised standard and to remain competitive in the industry” (Mollenhoff et al. 2014, p. 44). Shared practice should be perceived as opportunity creation rather than competitively threatening, and would represent a positive disruption to institutionalised practices that create unintentional harms. Such opportunities are reflected in the ‘Just Ask’ campaign launched in March 2014 by the Company of Master Jewellers (CMJ) whereby members were urged to ask their suppliers where an item comes from, in the hope that it could “instigate better clarity of provenance in the industry before our customers and future customers start to ask” (Bishop 2014, p. 1). This campaign, targeted at both production and consumption stages of the industry, does have the potential to impact further upstream. In addition, SME jewellers need to build confidence to navigate the complexities of their industry in terms of CR, and overcome fears that customers will make unfavourable comparisons about what they are not doing if they initiate discussions at point-of-sale about responsible purchasing. Despite appeals for the industry to be more publicly accountable for responsibility performance (European Commission 2014b; Earthworks 2010, 2013), it appears that SMEs are currently reluctant to move too far ahead of the consumer. This study explored the potential for harm and value creation by SME stakeholders in fine jewellery production. We sought to understand how small businesses within the fine jewellery industry respond to the economic, social and environmental challenges associated with responsible jewellery production, and to investigate how small businesses perceive and negotiate the tensions between responsibility and the resistance derived from the operational norms of secrecy and autonomy within the industry. CR has increasingly become the focus of enquiry by scholars, policy makers and practitioners who seek a bespoke research agenda for more high-quality theoretical and empirical research. However, within that agenda the issue of business responsibility within the context of SMEs has been under-investigated (European Commission 2013b; Sen and Cowley 2013; Jenkins 2009; Spence 2007). This research sought to contribute to the literature by addressing this gap, providing a richer understanding of business responsibility in a previously under-researched industry context, and offering greater opportunity for theory and management practice development in the area of small business and CR research. The jewellery industry presents a particularly complex sector wherein a number of high-value, high-risk and highly fragmented supply chains feed into an end product that is globally traded. The findings from this study offer unique insights regarding CR opportunities and barriers to those studying and operating within this specific industry, but which will resonate across similarly complex supply chains. Most jewellery industry research to date has focused upon upstream issues relating to precious metal and gem extraction and its social, economic and environmental impacts upon local communities (Childs 2008, 2014; Hilson 2008). This study connects that body of research to downstream stakeholders, and highlights the mutually dependent CR connections from mine to market, and market to mine. Our second contribution is to extend existing research beyond mainly conceptual discussion by using the harm chain and institutional theory to frame our empirical investigation of small business CR. This has revealed how complex harm networks operate within and across the jewellery industry, and demonstrated the inter-relationships that exist across the different stages of the harm chain. Our third contribution entails the key original findings of this study, which present primary data that contribute to current debates on responsible business practices within complex industries such as that of fine jewellery. Our study has its limitations, as it is a small-scale study of a single industry, conducted in a specific geographic cluster, albeit one with global reach. Despite this, it has produced more nuanced insights into the responsible business practices of SMEs. Our purpose was to explore rather than seek generalisations; whether or not the evidence from this study can be generalised remains undetermined, since the experience of UK small fine jewellery businesses may not be mirrored elsewhere. However, it does provide a launch point for future research into CR and SMEs. We recommend research that seeks to understand SMEs and their CR practices in different countries, because different forms of business responsibility “differ among countries and change within them” (Matten and Moon 2008, p. 404). The contextual influence of alternative institutional frameworks also impacts upon the CR agenda of SMEs (Pedersen and Gwozdz 2014), therefore we suggest an examination of SMEs and their CR practices in developed and developing economies, the latter in particular offering intricate complexities within indigenous industries (Soundarajan et al. 2013). This research also makes the case for a larger study of the jewellery sector in multiple country sites (e.g. Canada, Italy, India, China), using different methodologies to identify how responsible business processes are regulated, validated and habitualised by jewellery firms and trade associations in different national contexts. By the same token, institutional forces differ across sectors (Jackson and Apostolakou 2010), so studies of SMEs and their CR practices within and across different sectors, including similarly complex supply chains such as high-tech manufacturing (computers, mobile phones) and the food industry would prove a fruitful research direction. In this study, we adopt the terminology suggested by Spence (2007), and use SME interchangeably with ‘small business’, since SME is a less familiar term in North America, and small business captures those firms with up to 250 employees. Global Reporting Initiative core performance indicators cover economic, environmental, labour practices and decent work, society, human rights and product responsibility. See https://www.globalreporting.org/resourcelibrary/g3.1-quick-reference-sheet.pdf. Before embarking upon the study, the authors gained approval from their respective research ethics committees. Assay offices specialise in the hallmarking of gold, silver and platinum. Hallmarking was established for the protection of the public against fraud and of the trader against unfair competition. Hallmarking is one of the oldest forms of consumer protection. Birmingham Assay Office was founded by an Act of Parliament in 1773. The Responsible Jewellery Council is a not-for-profit organisation setting standards for responsible business practice across the jewellery supply chain. Blood Diamond was a Hollywood film from 2006 based on the story of conflict diamond trading in Sierra Leone. Union Française de la Bijouterie, Joaillerie, Orfèvrerie des Pierres & des Perles. Bafilemba, F., Mueller, T., & Lezhnev, S. (2014, June 10). The impact of Dodd-Frank and conflict minerals reforms on Eastern Congo’s War, Enough Project. Retrieved March 24, 2015, from http://www.enoughproject.org/reports/impact-dodd-frank-and-conflict-minerals-reforms-eastern-congo%E2%80%99s-war. Bishop, K. (2014). CMJ focuses on provenance with Just Ask campaign, Professional Jeweller. Retrieved April 1, 2014, from http://www.professionaljeweller.com/article-14349-cmj-focuses-on-provenance-with-just-ask-campaign. Bradshaw, K. (2012). Business ethics: Am I boring you? In Outstanding writing on professional ethics and business. Professions for good. Retrieved November 30, 2013, from https://www.dur.ac.uk/resources/business/GrahamDietz_P4G_Outstandingwritingonprofessionalethicsandstandards_Jan13.pdf. Chapain, C., Cooke, P., de Propris, L., MacNeill, S., & Mateos-Garcia, J. (2010). Creative clusters and innovation: Putting creativity on the map, Research Report, November. NESTA: London. Retrieved June 5, 2014, from http://www.nesta.org.uk/areas_of_work/creative_economy/assets/features/creative_clusters_and_innovation_report. Earthworks. (2010).Tarnished gold: Assessing the jewelry industry’s progress on ethical sourcing of metals. Retrieved February 20, 2014, from http://www.earthworksaction.org/files/publications/TarnishedGold_FINAL.pdf. Earthworks. (2013). More shine than substance: how RJC certification fails to create responsible jewelry. Retrieved April 1, 2014, from http://www.earthworksaction.org/files/publications/More-Shine-Than-Substance-FINAL.pdf. European Commission. (2011). Communication from the Commission to the European Parliament, the Council, the European Economic and Social Committee and the Committee of the Regions: A renewed EU strategy 2011-14 for Corporate Social Responsibility. Retrieved March 26, 2014, from http://ec.europa.eu/enterprise/policies/sustainable-business/files/csr/new-csr/act_en.pdf. European Commission. (2013a). Small and medium-sized enterprises (SMEs): Fact and figures about the EU’s small and medium enterprises (SME). Retrieved from March 26, 2014, from http://ec.europa.eu/enterprise/policies/sme/facts-figures-analysis/index_en.htm. European Commission. (2013b). Opportunity and responsibility: How to help more small businesses to integrate social and environmental issues into what they do. Retrieved March 25, 2014, from http://ec.europa.eu/enterprise/policies/sustainable-business/files/csr/documents/ree_report_en.pdf. European Commission. (2013c). Tips and tricks for advisors: Corporate social responsibility for small and medium sized enterprises. Retrieved March 24, 2014, from http://ec.europa.eu/enterprise/policies/sustainable-business/files/csr-sme/tips-tricks-csr-sme-advisors_en.pdf. European Commission. (2014a). Regulation of the European Parliament and of the Council setting up a Union system for supply chain due diligence self-certification of responsible importers of tin, tantalum and tungsten, their ores, and gold originating in conflict-affected and high risk areas. Retrieved March 6, 2014, from http://rjc.worketc.com/?SendFile=14a444d7-44d7-424d-818d-2e2059a1c7e6. European Commission. (2014b). Innovation in SMEs. Retrieved from February 14, 2014, from http://ec.europa.eu/programmes/horizon2020/en/h2020-section/innovation-smes. Jordan, S. L. (2015). Arctic Circle goes Fairtrade with Hockley Mint, Professional Jeweller, January 20. Retrieved March 5, 2015, from http://www.professionaljeweller.com/article-15550-arctic-circle-goes-fairtrade-with-hockley-mint/. Layton, S. (2015). Conflict minerals, nickel regulation, platinum fineness and chemical classification under the spotlight. CIBJO Precious Metals Commission, Special Report 2015. Retrieved March 11, 2015, from http://congress2015.cibjo.org/CIBJO%20Special%20Report%202015%20(Precious%20Metals).pdf. Mollenhoff, J., Quinn, H., & Sjogren, I. (2014) Small to medium-sized enterprises (SMEs): Uptake, access and impact of certification in the jewellery supply chain. Graduate Institute of Geneva Report for the Responsible Jewellery Council and Richemont, December 10. Retrieved March 26, 2015, from http://www.responsiblejewellery.com/files/Sj%C3%B6gren_M%C3%B6llenhoff_Quinn_ARS_RJC.pdf. Murry, N. (2014, March 13). Why Europe’s opt-in rules on conflict minerals could fail to spark change. The Guardian. Retrieved March 26, 2015, from http://www.theguardian.com/sustainable-business/european-commission-conflict-minerals-failure. Rhode, D. (2014, March 24). The Kimberley Process is a perfect cover story for blood diamonds. Guardian Professional. Retrieved June 3, 2014, from http://www.theguardian.com/sustainable-business/diamonds-blood-kimberley-process-mines-ethical.